Two days ago, soon after the Congress announced that Atal Bihari Vajpayee's niece Karuna Shukla would be the party's candidate against Chhattisgarh Chief Minister Raman Singh, she moved bag and baggage from Raipur to Rajnandgaon. Scathing about the Bharatiya Janata Party's exploitation of her chacha's name to win votes, Shukla says the BJP under Modi and Shah has relinquished Vajpayee's ideals and become a two-man party. Shukla -- a former BJP Lok Sabha MP and MLA -- left the BJP after 34 years in 2013 and joined the Congress. In 2014, she lost the Lok Sabha election from Bilaspur. "Vajpayeeji is the founder of Chhattisgarh and was ailing for 9 years. In this period whenever there were elections Raman Singh never thought of putting any banners/posters of Vajpayeeji in Chhattisgarh -- and suddenly they are venerating him,", Shukla, who is the daughter of Vajpayee's elder brother tells Rediff.com's Archana Masih. Why were you so upset when the BJP took your uncle's ashes to all the states? Atal Bihari Vajpayee, who was the founder of Chhattisgarh, was ailing for 9 years. In this period whenever there were elections Raman Singh never thought of putting any banners/posters of Vajpayeeji in Chhattisgarh. Since five states were going to the polls soon after Vajpayeeji's death, the prime minister and BJP president walked on foot in the funeral procession. When a memorial was held for Vajpayeeji by Raman Singh in Chhattisgarh and Shivraj Singh Chouhan in Madhya Pradesh, there were ministers who were caught laughing at the solemn function. This has pained me as a Congress worker and as his niece. Why did you leave the BJP after 34 years? The BJP is controlled by the Sangh. In its quest to gain power the BJP changed its chore character and values. The party has lost its ideals. The measure of the party is only political power and for that it has made compromises by aligning with different parties. Ram Jethmalani, who stood against Atalji in Lucknow, was made a Rajya Sabha MP by the BJP. The party has insulted its senior leaders -- L K Advani, Murli Manohar Joshi, Yashwant Sinha. Advaniji, who stood shoulder to shoulder with Atalji, they have insulted him at every step. I have myself been subjected to this. I did not want to be in a party which did not respect me. How is the BJP under Narendra Modi different from the BJP of Atal Bihari Vajpayee? Vajpayeeji's BJP was democratic. It was a BJP that belonged to its party workers. Every worker, every member was an Atal Bihari. Today's BJP belongs to businessmen. The way Narendra Modi and Amit Shah are running the BJP has reduced the BJP to a two-man party. But Modi and Shah have propelled the BJP to a vote-winning party? They have been giving false promises and jumlas to the public. The people can see through this farce. The support of businessmen has bolstered the party's finances. They are not winning elections because of ideology, but because of money power. 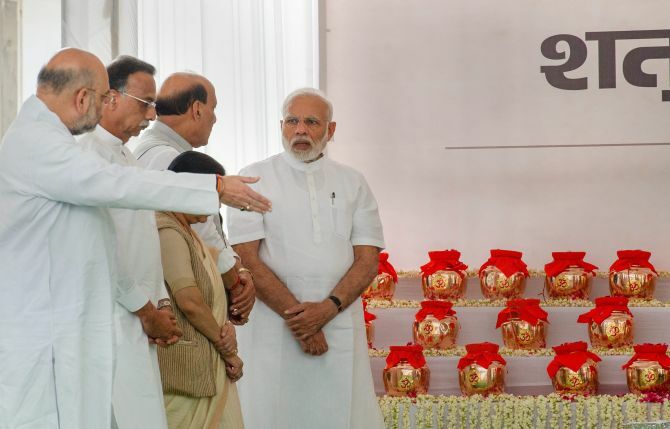 IMAGE: Modi after paying tribute to Vajpayee's ashes, before their distribution to all BJP state presidents for immersion in the rivers in their respective states, at the party headquarters in New Delhi. Raman Singh has named the new state capital Atal Nagar after Vajpayeeji and has announced many projects after him. A medical college in the constituency you are contesting is also named after him. I have no objection to anything being named after Atalji, but one has to look at the motive behind all this. Atalji's personality transcended all sorts of barriers -- he was respected by all political parties, he was the prime minister of the country, a Bharat Ratna -- how can you restrict him within a self defined boundary. How can you use his name for political gains? They did not remember him for the last 10 years and suddenly they are venerating him. The voters can see through this charade. The Congress has fielded you against a strong opponent, a three-term chief minister. It is going to be a tough battle for you. Raman Singh will take the help of the administration machinery, while I am stepping into the battleground with only the help of Congress workers and ordinary people. The farmers, youth, women and people of Chhattisgarh will reclaim their self esteem by voting out the Raman Singh government. 15 years after being CM, what difficulties will Raman Singh have to encounter in battling a fatigue that is likely to have set in after three terms in government? Raman Singh is the MLA from Rajnandgaon, while his son is the Lok Sabha MP from Rajnandgaon. Raman Singh accuses the Congress of dynastic politics, but has perpetuated dynasty in politics himself. Both father and son have been accused of corruption. The corruption in Chhattisgarh under Raman Singh is unparalleled compared to other states. The prime minister says he will get back black money when his own chief minister's son is allegedly linked to black money. In Chhattisgarh Raman Singh's government sells liquor -- prohibition will be a big issue in this election. The state has seen 1,900 farmer suicides in the last 15 years. In the last election the BJP government promised it would give a bonus to farmers and won the election, but only gave bonus for two years just before the election was announced. If the Congress comes to power we will give the remaining bonus of two years and waive farmers's oans. When did you last meet Vajpayeeji? He was my chacha. He had been ailing for nearly 10 years. I met him whenever I went to Delhi. 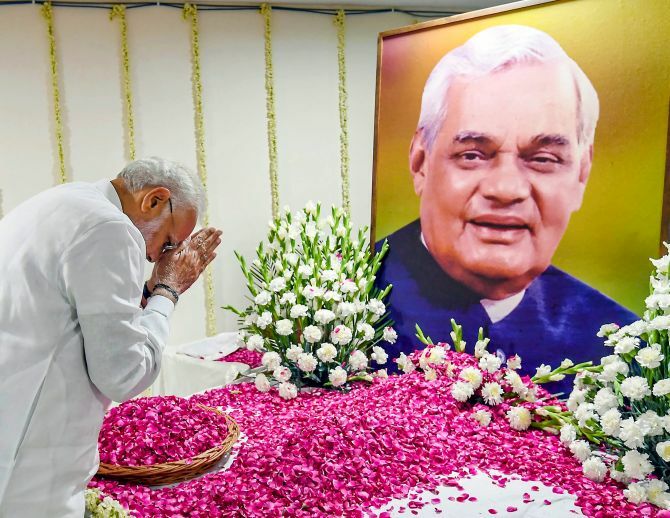 The Vajpayee family has over 250 members, many came on hearing news of his passing. He was the thread that bound the family together. Won't the coming together of Ajit Jogi's Janata Congress Chhattisgarh and Mayawati's BSP cut into Congress votes? Jogiji first announced that he would contest the election against Raman Singh from Rajnandgaon. He seems to have some tacit understanding with Raman Singh and that's why he has abandoned that idea. (Ajit Jogi is not contesting the election). Jogiji's stature has diminished after he left the Congress. The BSP has 3 to 4% fixed votes in Chhattisgarh, but how this will translate into votes will be known when the results come.